Short Review: Veteran UK grappling instructor Nathan Leverton covers the basics of attacking the turtle in the course of this 69 minute video. The context is grappling for MMA, so that includes strikes, but most of the material remains relevant to pure grapplers as well. As this is seminar footage, the production quality is not as high as purpose-built instructionals, though it does include elements like zooming in on details. If you struggle against the turtle, then this will provide you with a useful game plan. Available to buy here for £9.99. Full Review: Nathan 'Levo' Leverton has been making instructional videos for a long time. Back when he was first teaching people how to grapple on video, that meant VHS tapes. From his TotalGrappling.com website, Levo sold acclaimed grappling material over ten years ago. In that time, VHS has been consigned to charity shops and attics. DVDs are not quite at that stage just yet, but there is a growing shift to online material. In the BJJ world, sites like MGinAction and BJJ Library are becoming the norm, with innovations like Mastering the Crucifix showing another possible format. While this sadly isn't a review of LevoInAction.com (though that's a site I'd be interested in seeing), he does have some material available to download. As part of the annual 'Super Seminar' event (which took place in May of this year, at Masters Martial Arts in Loughton, Essex), Leverton taught a session on Grappling for MMA, opting for a catchier title of 'Ninja Turtle'. In total, your ten pounds gets you an hour and nine minutes of grappling instruction, edited directly from the seminar footage. That means that the quality is not as high as you would find on an instructional filmed in a studio with multiple angles, slow motion and the like. It also often means there isn't that clear distinction between Leverton and his uke, because the uke is just somebody pulled from the people attending. For many of the techniques, both Leverton and the guy he's demonstrating on are wearing black. You also generally just see it from one angle. Having said that, it isn't a major problem, especially as I know from first-hand experience that Levo teaches a fantastic seminar: he's a detailed and very capable instructor. The camera also tends to zoom in when greater detail is required. I did not come across more than one or two instances when the relevant limbs weren't clearly in view, and even when they weren't it was easy enough to work out what was happening. 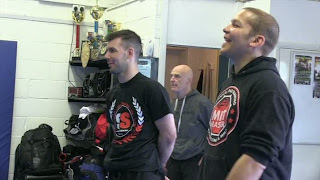 The footage kicks off with the organiser introducing Leverton (while Bob Breen stands in the background: pretty cool, as although I've never trained with him, he's a legend on the UK martial arts scene and the man who first taught my old training partner Howard how to grapple, IIRC). Nathan then gives his own introduction, before getting into the first technique (at this point, roughly four minutes into the video). As you would expect with a seminar about the turtle, Leverton starts by showing how to maintain the top position (the whole video is about attacking: there is no coverage of escapes or defence). This part of the video looked fairly familiar, as he taught the side ride at the LSG seminar I attended last year. Interestingly, Leverton's version differs a little from how Aesopian does it on Mastering the Crucifix, in terms of knee positioning. Aesopian (at least in some of the gifs) raises his knee a little, putting it into their thigh and leaning into them. In this video, Leverton has that knee on the floor, directly next to their knee. When I taught a class on maintaining the position myself last month, I had the knee off the floor. However, I was heavily drawing on what I'd learned from Levo: as the theme at Artemis BJJ was turtle all of September, it was the perfect opportunity to test what I'd gained from both the video I'm reviewing here and Aesopian's instructional. Using your hands as hooks is a particularly useful concept: I've been using it ever since I learned the technique from Levo at that Leverage Submission Grappling seminar. Leverton spends about two minutes teaching this position, then there is another minute and a half or so of drilling. As an instructor, I liked that the camera didn't immediately cut away when it got to drilling. Instead, the camera followed Leverton around the room as he answered questions and made technical connections (on most of the other techniques in this video, it cuts straight to the next technique). It was also interesting that he uses the John Will teaching method: in other words, having everyone face the same way. That makes it easier to quickly scan the room to see where people might be making mistakes. I've been using that for reviewing technique at the end of class, but recently I've brought it in earlier to see if that helps technical retention. Leverton notes that he likes to grab the wrist from the side ride, which he says is due to seeing Nick Diaz versus GSP in an MMA fight. That leads into the major difference in this video to a jiu jitsu instructional: as it is geared towards MMA, strikes are covered as well. Leverton spends about three minutes discussing how to punch your opponent from the side ride, though there is still material here relevant to BJJ. For example, right before he gets into hitting his uke, he adds a useful little detail on keeping your basing leg bent. If you have it straight, that limits your mobility. That's followed by some pointers on weight distribution. If you're at the front, you'll be maintaining the position differently than if you're at the back. Misjudge it and you can find yourself getting lifted into the air, straight into an inferior position. Your posture when right behind them - which Levo says has occasionally been dubbed 'prison jitsu', tongue firmly in cheek - does look odd at first. I'm used to it due to the LSG seminar, but previously I would have thought sprawling out and turning your hip was the way to go. Staying tight provides a different kind of control, with no gaps they can exploit. Rather than sprawling, Leverton has his knees tight around them, squeezing into their hips. This is the same way Dónal (co-founder of Artemis BJJ) does it as well, so I guess that his instructor Braulio Estima (or possibly Norbi) teach that method too. After a couple of minutes on that, Leverton emphasises how shallow the hand 'hooks' are reaching inside their thighs, in order to prevent your opponent from wrapping your elbow and rolling you over. He then progresses to the spiral ride, a wrestling technique (in keeping with Leverton's approach to the back, much of it is informed by wrestling, from what I can gather after his LSG seminar). This is useful if they try to raise up. Reach for their shoulder, while lifting up into their hip with your other hand. That enables you to run around and knock them back to the mat. The force you're creating spirals them down, hence the name. You're pushing the hip up and the shoulder down. Four minutes later, Leverton adds in some more punches, plus a brief recap of some of what he's taught up to this point (in total another two and half minutes or so). Next up is a little over three minutes on a useful principle: stay behind your opponent if you can. Again, this is something Dónal likes too, teaching a similar drill last month. If they turn to one side, you run away from their legs to stay behind them. Any time you feel them rolling to one side, you're always looking to move away from their legs. If you run towards their legs, that gives them an easy route to recover their guard. Leverton then covers something a bit nastier, the three quarter nelson, a grip around their neck. Typically for nastier grappling techniques, this is from catch-wrestling, a style memorably referred to by its (currently) most high profile practitioner Josh Barnett as 'the violent art'. That's exactly why I shy away from catch-wrestling techniques: they're often about pain compliance, adding in elbow grinds, neck cranks and the like wherever possible. Of course, just because I don't want to hurt my training partners doesn't mean that doing so isn't effective (and I have to admit that a few techniques I do regularly use are sometimes seen as 'nastier', like heavy cross-facing and various chokes from side control). Leverton first shows how the three quarter nelson can be used to drive a stronger opponent back down to the mat, circling around on your toes after you've established the grip. The nastiness comes in from the considerable strain this can put on the neck. That's also true of the d'arce choke Leverton adds at the end a few minutes later. He points out that distinction between catch wrestling and BJJ when he compares two black belts who he's had the chance to roll with a few times. Ryan Hall was disappointed when Leverton told him that the d'arce choke he'd just landed was verging towards a neck crank. Roli Delgado by contrast was pleased: in his opinion, if you tap, that's what counts. I would fall firmly on Ryan Hall's side there, but Delgado has a point. It's also worth keeping in mind that this is a grappling seminar geared towards MMA. Illustrating that point, Leverton suggests punching them if they try to lift their head up, in an effort to avoid your application of the quarter nelson. When you're used to getting entangled in the Goridan Knot of jiu jitsu, it's easy to forget that in an MMA context, a punch to the face can often cut through all that complexity. In regards to the d'arce choke (around five minutes of instruction), Levo advises that you don't whack it on fully to start with. Begin with about 80% pressure, then gradually increase until they tap. If you begin at 100%, you've got nowhere to go. Your arms will tire faster and you may have to loosen up. That can give them the impression that they can tough it out and escape. If you never loosen up, then psychologically they are only ever feeling a growing pressure so are more likely to tap. This tactical interjection is typical of Leverton's instructional style, with many other examples throughout the video. There are several great little tweaks here, such as the 'halfway' option if you're facing somebody who has a strong neck. After you've got your choking arm in position by the neck, reaching deep, post your other arm on the floor directly behind their neck. Grab that wrist, creating a solid bar to lock your grip in place, ready to adjust into a d'arce. Leverton has an additional four minutes of details to share, such as a tip for those who think their arms are too short. Finally on the d'arce, he covers a variation for another four minutes, the sit through d'arce. Rather than getting them on their side and attacking, you sit-through in front of them, finish the d'arce underneath them. The motion is a little like the step you do for a clock choke, but you then swivel underneath their head rather than keeping your weight on their shoulders. Forty three minutes into Ninja Turtle is the technique I most wanted to see when Leverton sent me this for review: the crucifix. As I had recently reviewed Matt 'Aesopian' Kirtley's Mastering the Crucifix and was about to embark on a month of teaching the turtle, I knew that I wanted to make the crucifix a big part of it. Leverton's take was therefore handy when I came to teach my first class on the crucifix last month, especially as I needed both gi and nogi versions (as a number of students didn't have a gi yet). Before he gets to the crucifix, Leverton has a quick note on trapping their leg under your shin, as this stops them rolling back to guard. If they try and swing through anyway, you're in a good spot to move into a leg drag and back step to pass. For the crucifix, you want to drive your knee in behind their arm, then flare the knee out to help secure their limb. Leverton's side ride means you're already grasping their bicep, making it simple to pull that arm out in order to trap it between your legs. Normally, they will curl their arm back at this point, according to Levo. If they don't, then there is a simple keylock you can do by sitting back on their shoulder and pulling up on their wrist (this is also one of those rare points where it is a bit hard to see exactly what's going on, because Leverton and his uke are both in black). Should they try to trap your elbow and roll you over - a common escape from the turtle when somebody reaches too far under with their arm - that puts you into the face-up crucifix you wanted in the first place. This is what Aesopian sees as the standard crucifix. Leverton maintains the position slightly differently, as can be seen when he's discussing what to do if they are slipping down. On Mastering the Crucifix and I think also the Dave Jacobs seminar, the response is to scoot underneath their head. That results in the back of their head resting your chest. Leverton pulls them up onto him much more and turns his knees away. He then also very briefly comments that there are two submissions you can apply, a north-south choke and a kimura (literally a couple of seconds, putting his arm in the relevant configuration). I've not seen either of those attacks from the crucifix taught before (unsurprising, as I've only had a few lessons on it, along with the seminar and Aesopian book), so it would be interesting to explore those submissions in greater depth. The next three minutes are on the single arm choke, informing (along with Aesopian's version) the class I taught on that technique in September. Leverton includes a principle I've found repeatedly applicable since first seeing it on an Andre Galvao instructional, about getting under the chin of somebody stubbornly using it to defend against your choke. Rather than some brutal jaw destroying option (I'm looking at you, catch wrestling ;D), you just need to get your thumb underneath their chin. Galvao does it from the standard back control, pointing his thumb down, then swivelling the thumb up as he slides the choking hand towards the head. Leverton does much the same thing from the crucifix (and looks really happy about it too, judging by the screenshot). He contextualises this detail by showing how it's tough to get your forearm under the chin, because that's a large slab of your body. A thumb is much smaller, capable of wriggling into the gap and prying the chin away from that vulnerable neck. If they bridge into you, he additionally demonstrates how you can now insert your hooks, finishing the choke from standard back control. That's followed by five minutes on what to do if they turn and begin to escape the crucifix. The MMA solution is to punch them in the face, then if you lose control of their arm, you can turn and lock in a guillotine from guard. Another five minutes or so looks into another technique I remember from the LSG seminar, this time tilting them from turtle into a standard back control. There's a good principle espoused again here, explaining how they might be strong on the horizontal and vertical lines of their defensive turtle 'box', but they are not able to resist so well on the corners. The seminar closes with a few minutes on bringing all those techniques together, before another couple of minutes on MMA strategy. As Leverton puts it, "Wrestle the jits guys, jits the wrestlers." If they are wrestlers with a solid base, wrap around them with your arms for a choke, or your legs to get your hooks. If they are jiu jitsu players who want to sit to guard, grind their face into the mat and dominate them with positional control. If you have trouble attacking the turtle, then Leverton's Ninja Turtle will provide you with some useful tools, taught by an excellent instructor. He shows you how to position yourself on top, maintain your dominance, strike from there (if you're interested in the MMA context), launch a variety of attacks and also how to achieve the standard back control. He doesn't show you what to do defensively, so you'll need to look elsewhere for that. The value for money is not bad at £10 for slightly over an hour of instruction. If I compare it to my favourite no gi instructional, Roy Dean's No Gi Essentials, that costs around £28 and is roughly twice as long as Leverton's video (although there are quite a few trailers and artistic videos on Dean's DVD). Having said that, if you're not interested in striking, it does cut down the amount of useful material on Ninja Turtle. Available to buy (as a download) from here.